The Saracen leader and general Saladin died on 4th March 1193. He is renowned as being the leader who opposed England’s King Richard the Lionheart during the latter’s campaign to capture Jerusalem during the 3rd Crusade. Indeed, it was because Saladin had defeated the Christian forces at the Battle of Hattin in 1187 that Richard was persuaded to “take the Cross” and become a Crusader. Despite many encounters between the armies of the two leaders, neither was able to get the better of the other, although Richard eventually saw that he was never going to succeed in his quest and withdrew in October 1192. 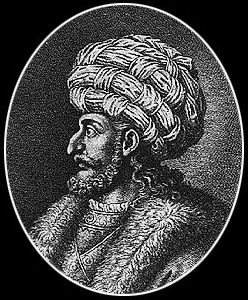 Saladin was renowned for being an honourable general who never resorted to “dirty tricks”. He even sent Richard and his captains gifts of wine and fruit to ease their life when encamped during a siege. On one occasion Richard’s horse was killed underneath him and the king could easily have been finished off by Saladin’s troops. However, Saladin gave orders that a fresh horse should be sent to Richard so that he could continue the battle. By an odd coincidence, Saladin came from the city of Tikrit, which was also the birthplace of a much later Arab leader, Saddam Hussein. However, the gulf between the characters of these two men was about as wide as could be imagined. As he lay dying, from a fever at the age of 55, he gave instructions that his funeral shroud should be shown to the people as a statement that, despite all his conquests, this was all that he would be taking with him.